BORDER PRO 10 inch - 4inch Templates to cut around or draw around the outside or inside edge depending on size required,insert inner sizes to allow for easier handling,these were designed to aid a disable patchworker /scrapbooker to allow an exact cut every time. 4 separate templates included in this set. Other sizes available. 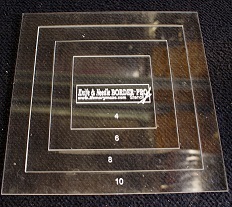 Also available in photograph sizes to allow for easy bordering for scrapbookers and cardmakers.